Inevitability in sports is simply an extension of the existing tension between favorites and underdogs. What seems inevitable at any given time in any given sports is that which the rest of the sport attempts to topple. A certain pursuit of destruction of the status quo keeps the standard-bearers honest and the rest earnest. What is remains; what will be, will be. For so many reasons, both external and internal, the Golden State Warriors have seized the NBA’s current moment. What LeBron James is to the Eastern Conference, the Warriors have become to the entire league, the defining signpost any opponent must pass on the way to a championship. Once a seemingly burgeoning dynasty, however, the Thunder isn’t here for the noise. Now, after a franchise-altering trade and a series upset of the NBA’s most consistent team, nothing is inevitable in Oklahoma City. Among his many other gifts to humanity, Mike Tyson gave us the following quote: “Everybody has a plan until they get punched in the mouth.” After stealing a game away from home, the Thunder haven’t so much punched the Warriors in the mouth as flicked them in the ear. By no means was it a complete or dominant performance, but a win is a win, especially to take an early series lead over a team that has only lost eleven total games this season°. Russell Westbrook doesn’t strike me as a guy who thinks too much about the inevitable. His on-court mentality seems so deeply set in the present, free from such abstract ideas as time remaining or the score of the game, that to suggest any possibility of an end beyond his control would be blasphemous to his ethos. Westbrook-in-chaos: that’s the inevitable nightmare that every opponent of the Thunder must face, even irrespective of his seven-foot teammate, who can shoot efficiently from dimensions beyond our own. 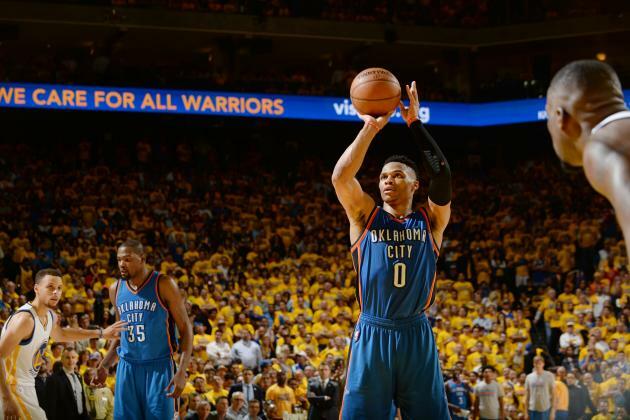 Westbrook proved as such in the third quarter of Game 1. Having accumulated a grand total of 3 points in the first half while the Warriors stretched their lead to as much as 20, the Thunder returned as if they had been dusted in gun powder and shot out of a cannon. Westbrook scored 19 points in the third alone, on his way to a game-high 27 points to go along with 12 assists, six rebounds and a franchise-record seven steals. Though Kevin Durant (26 points and 10 rebounds)¹, Steven Adams (16 and 12) and Serge Ibaka (11 and 11, make a wish) all contributed double-doubles, and though Westbrook shot an objectively egregious 7-for-21 from the field, and though Durant ultimately made the game-sealing play and hit the free throws…it just felt like Russell Westbrook’s game, like he was smashing paddles at the head of a pinball machine, keeping the ball in motion with a mug full of quarters and an attentive audience watching in awe. Despite the minor shock of blowing the first game at home, the Warriors don’t figure to lose tonight. Neither Steph Curry nor Klay Thompson, Golden State’s resident explosives experts, shot as well as we’ve come to expect in Game 1, going a combined 20-for-47, nor was the Warriors’ bench as sterling as usual either. A rebound from that seems likely. With a Game 1 win in hand, however, Russell Westbrook and the Oklahoma City Thunder have already accomplished what they set out to do, at least for the first part of this series. When volatility is the norm, and the only inevitability is that nothing is inevitable, that is where the Thunder thrive. ° A word here on the referee controversy at the end of Game 1: it happened, and there’s nothing any of us can do about it. Steve Kerr made an excellent point about making the postgame officiating reports public: “It’s unfair to the officials. I feel like it throws them under the bus.” He’s right. The reports can serve some teaching purpose, such as in the Dion Waiters inbounds pass situation, but to make them public undermines the referees to an extent and is unnecessarily incendiary for fans and the media alike. ¹ NOT AT ALL trying to downplay Durant’s contribution; after shaking off whatever devil had a hold on him at the start, he had a great second half as well. All of which makes Westbrook’s furious charges, and the Thunder’s holding on to the lead once they had it, that much better.